A hijab-wearing model has proven that her fashion style is truly en vogue as she makes history wearing her cultural headwear on the cover of British Vogue. This is the first time in the magazine’s 102-year history that a model has been featured wearing a hijab covering her hair, reports Independent. 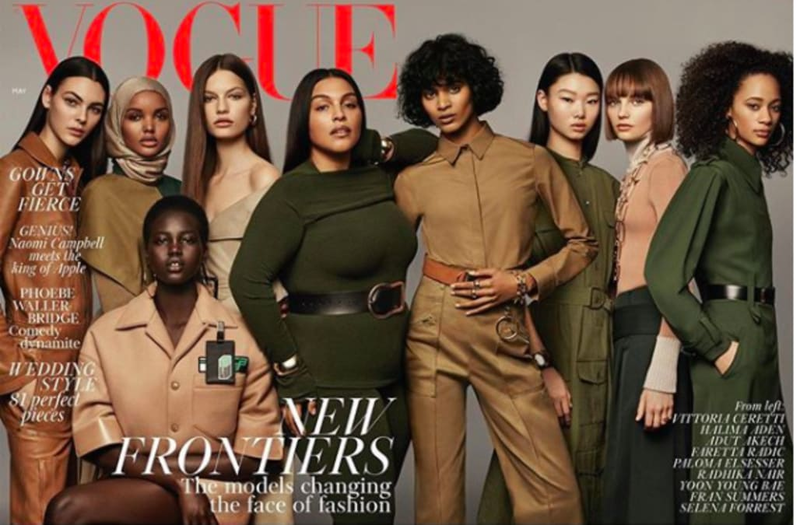 Halima Aden will be joined by other diverse models like Adut Akech, Radhika Nair, Yoon Young Bae, Faretta, Fran Summers, Vittoria Ceretti, Paloma Elsesser and Selena Forrest as the magazine launches the May fashion’s “New Frontiers” cover. Two of the models, Aden and Akech were both born in the Kakuma refugee camp in Kenya. “To me they represent a new global idea that anything is possible,” wrote Edward Enninful, the magazine’s Ghanaian-born Editor in Chief. The magazine has been under fire for it’s lack of diversity and Enninful pledged as the new editor in chief that he would work to push the magazine toward being more inclusive. “When I say diversity, I want to be clear that it is never just about black and white for me,” Enninful said. He is the first man to ever serve as the powerhouse magazine’s editor. So far people are receptive to the nine “New Frontiers” cover. The picture on British Vogue’s Instagram has garnered more than likes 24,000 likes. “It is a moment for Vogue to do what it has always done best: to offer a bold vision of what the future can – and should – look like,” Enninful wrote. Enninful said it was important to make fashion choices that not only complimented the ladies but made them feel empowered. He oozed with excitement about the end result. “The shoot was incredible, watching our group take such an important first step in their careers with this special Vogue cover. What really struck me, despite their varied backgrounds, was how similar they all were. Kind, engaged, socially minded and impressively sweet to one another. The post ‘British Vogue’ makes history with diverse new cover appeared first on theGrio.